Cut the fruit, brie and shrimp. Cut grapes in half. Cut the apples into small cubes. Cut the brie into thin slices. Cut the shelled shrimp into small 1 to 1/2 inch chunks. Place whole pita onto an ungreased cookie sheet and smear with Swiss cheese. 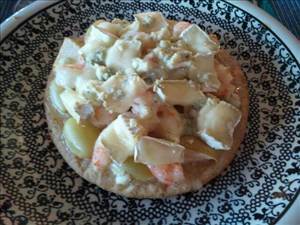 place grapes, apples and shrimp on top of the cheese spread. Next the gorgonzola crumbles and the brie. Note: chicken can be used instead of shrimp, alfredo sauce or cream cheese instead of spreadable Swiss cheese, mozzarella instead of brie and parmesan instead of gorgonzola. eeeaak....clarification: it's not swiss cheese, but Laughling Cow Cheese Spread. You can't spread swiss cheese. Wholey editing! I hace tried this recipe with just about every kind of spreadable cheese. Cream cheese also works well in a pinch but the Laughing Cow is the easiest to calorie count. Enjoy this is by far my favorite pizza! There are 451 calories in 1 serving of Brie Pizza aka Briezza. Calorie break-down: 46% fat, 32% carbs, 22% protein.